Osteoarthritis is degeneration of joint cartilage and the underlying bone, most commonly from middle age people and older. It is often referred to as ‘wear and tear’ arthritis that happens over the years of use. OA symptoms most commonly occur in the finger and hands, spine, knees, and hips. If OA is present in any of these parts, it will be difficult to move the joints, bend, and the area may feel stiff or look swollen. Causes of OA: Injuries can cause OA, but it’s usually rarer. Most often, OA is caused by wear and tear over a long amount of time by repetitive movement or posture. By this happening, joint cartilage eventually becomes eroded. Cartilage is a shock absorber, which makes it very important. It allows the joint to move smoothly and as it begins to break down it may lose its shape, which causes the bones to rub together. This causes swelling, pain, and loss of motion to the joint. Gender: OA affects both women and men. It occurs more often in men under the age of 45 than women. After the age of 45, OA is more common in women. Obesity: the amount of weight the joints have to hold up can increase chances of OA. 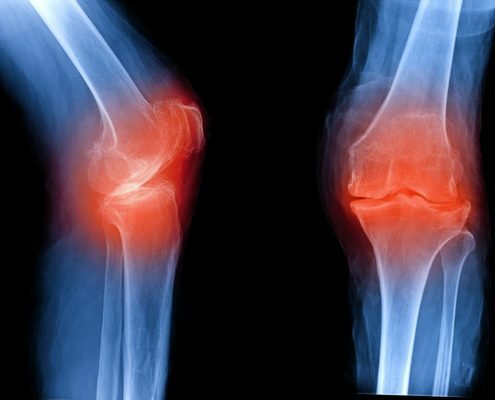 The knee is usually affected the most because it is one of the most important weight-bearing joints. Injury: if there is a traumatic injury to the joint, OA is more likely to develop. X-rays: This will help your doctor determine if you have a different form of arthritis or if you have osteoarthritis. X-rays in series over time can show the progression of the joint damage. Joint aspiration: A bit more invasive but often necessary; a needle is inserted into the joint which will pull fluid from the area to be examined. Analgesics: These are medications that relieve pain. They are over-the-counter drugs like acetaminophen but can also be prescription medications. NSAIDs: These are a specific pain medication (nonsteroidal anti-inflammatory drugs) that is usually over-the-counter or can be prescribed as a patch and applied to the area. Injections like corticosteroids (hormones) that reduce inflammation, pain, or swelling quickly. Hyaluronic acid: This is an injection used to replace the lubricant that is naturally lost in people who suffer from OA. This helps with most discomfort and movement problems. Surgery may be an alternate option if the corrosion is severe, an injury has caused the onset, and/or medication or injections provide no relief.